Andy Robinson writes to let us know about a new service from the club for slackers, part-timers, the retired and the non-gainfully employed …the Monday morning hill session. 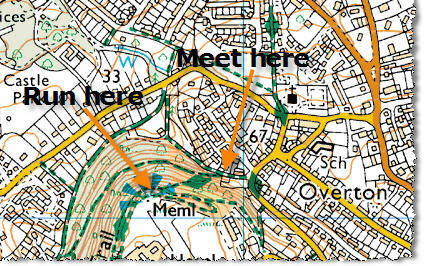 The format is simple: Monday mornings, 9:30, at the corner of the woods above the Ring o’ Bells, Overton (Frodsham). Look for Middle Walk on the map, just off Bellemonte Road. All we do is run up and down the Sandstone Trail zig-zags to the monument & back. It’s 60 metres of climbing per rep, and very good training for fell races. Contact me, Jackie or Janet beforehand to check who’s likely to be there. As Andy says, it’s great training for the fells and equally good for anyone wanting to add a bit of leg strength. This kind of thing has been called speedwork in disguise by some coaches. Ideal for all abilities, you’re guaranteed to benefit however many you do or however fast you feel like going. Good for a mixed group, you’ll find yourself doing your own thing and exchanging sympathetic glances as you pass each other on the way up and down, doing their own thing. just jealous because until recently I was in that group and able to enjoy the joys of the daytime session.